Cold temperatures, looking for an excuse to crank up my oven and thus pump more heat into my kitchen. The ultimate comfort food (at least today?) 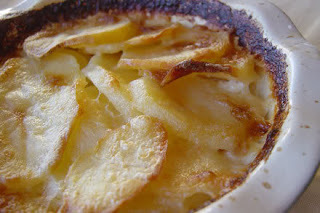 Scalloped Potatoes. These potatoes have a wonderfully creamy sauce infused with garlic flavor, don't be alarmed by the amount I've included, it mellows nicely during baking. 1/2 cup vegan Tofutti "sour cream"
If you're using a thick-skinned baking potato, you may want to peel them. I use "Yukon Gold" which have very thin, tender skins, so I just scrub them really well and leave the skins on. Mix flour, salt, pepper and paprika in a small bowl. Put milk and broth in a small pan and heat (stirring occasionally) to boiling. Slice the potatoes and onion as thin as you can - I use a mandolin slicer. Heavily grease a 9 X 12 baking dish. Place a a thin, even layer of potatoes and onions into a 9"x13" baking pan (about a third of the potatoes/onions). Sprinkle with about 1/3 of the flour mixture. After milk/broth has heated to boiling, add the vegan "sour cream", margarine, garlic and onion powders. Add pressed (or food-processed) garlic cloves. Whisk until the sour cream has melted into the hot milk. Pour about a third of mixture over layer of potatoes. Add another layer of potato slices, and repeat the flour, spices sprinkling and more hot 'milk' sauce. Do this until all potato slices are used up and top with final layer of sauce. Makes enough for 4 - 6 people. Ive had a mad potato craving lately. I think it's the cold weather. I'm afraid to make these because I think I'll just go after the whole pan with a fork. I am SO making this! I've got all the ingredients except the potatoes, but that can be easily remedied. It looks so creamy and rich and absolutely perfect for a chilly winter night. Mhmm... that looks really good. It's really hard to get Tofutti sour cream, but I'm planning on making my own sour cream out of silken tofu, and then I know, what recipe I'm going to make. By the way: My post with the lentil loaf is up! Hope you like it (half of the post is in English). And thanks for your nice comment! I'm not vegan, but this looks really good. I love garlic and love that you used coconut milk. Hmmm, that looks tasty. I think I have to make this! Just came across this recipe. It looks and sounds delicious! I love So Delicious Coconut Milk Beverages, and I cannot wait to try this!